Probably executed for a member of the Medici family. In the later 19th century, possibly in private collections in Paris and London. (Charles Sedelmeyer, Paris), by 1914; sold May 1925 to (Duveen Brothers, Inc., London and New York). Geneviève Garvan Brady [Mrs. Nicholas F. Brady, became in 1937 Mrs. William J. Babington Macauley], Manhasset, Long Island, New York, by 1932; William J. Babington Macauley; on consignment from 1939 with (Duveen Brothers, Inc., London and New York); sold January 1942 to the Samuel H. Kress Foundation, New York; gift 1943 to NGA. Whereas in similar compositions the armrest of Mary's throne has only a generic decoration, in NGA 1943.4.47 it bears what would seem to be the coat of arms of the Medici with six torteaux. As the king of France in 1465 permited Piero de' Medici to add to his coat of arms a seventh torteau decorated with fleurs de lis, its absence could indicate a terminus ante quem for the execution of the work. See Roy Brogan, A Signature of Power and Patronage: the Medici Coat of Arms, 1299-1492, Ph.D. diss., Florida State University, 1978 (Ann Arbor, Michigan, 1981: 156). The 1885 sale catalogue of the collection of Baron E. de Beurnonville (Paris, Féral, Lasquin; c.p. Chevalier, 30-31 June 1885, no. 240) includes a painting, cited also in two earlier sales of the same collection in 1883 and 1884, described as "La Vierge aux anges avec fond de paysage" ("the Virgin with angels and a landscape background") and attributed to Filippo Lippi. The identity of the subject and the attribution match those that accompanied NGA 1943.4.47 when it was offered for sale by Sedelmeyer in Paris (see note 4) and suggests that the two listings may refer to the same painting, although the measurements given in the de Beurnonville catalogue (79 x 51 cm) are different. William Graham sale, London, Christie's, 8 April 1886, no. 261: "Virgin and Child with two angels," measurements given as 28 1/2 x 21 1/2 inches. H. Mireur (Dictionnaire des ventes d'art, Paris, 1911: 4:344) identifies this as the de Beurnonville painting. Hundred Masterpieces. A Selection from the Pictures by Old Masters which form or have formed part of the Sedelmeyer Gallery, Paris, 1914: no. 63. According to the X Book, Reel 422, Duveen Brothers Records, accession number 960015, Research Library, The Getty Research Institute, Los Angeles. Bernard Berenson, Italian Pictures of the Renaissance, Oxford, 1932: 104, lists the painting with this ownership. See the letter of 13 November 1939 from Duveen to Macaulay (copy in NGA curatorial files; Box 529, Duveen Brothers Records, accession number 960015, Research Library, The Getty Research Institute, Los Angeles). The bill of sale from Duveen Brothers, Inc. to the Kress Foundation is dated 13 January 1942 (copy in NGA curatorial files). Cincinnati Art Museum, 1925 (according to the Duveen prospectus in NGA curatorial files; can not be confirmed). The Third Loan Exhibition of Old Masters. A Loan Exhibition from Detroit Private Collections, Detroit Institute of Arts, 1926, no. 6, as by Botticelli. Recent Additions to the Kress Collection, National Gallery of Art, Washington, D.C., 1946, no. 714. 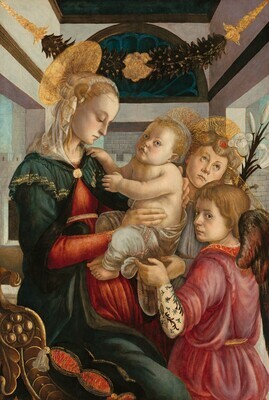 Money and Beauty: Botticelli and the Renaissance in Florence, The Bunkamura Museum of Art, Tokyo; Kitakyushu Municipal Museum of Art, Kitakyushu-shi, 2015-2016, no. 54, repro. (shown only in Tokyo). Hundred Masterpieces of the Sedelmeyer Gallery. Paris, 1914: 132, no.63, repro., as by Fra Filippo Lippi. Frankfurter, Alfred M. The Kress Collection in the National Gallery. New York, 1944: 30, repro., as by Botticelli. Paintings and Sculpture from the Kress Collection. National Gallery of Art, Washington, 1945 (reprinted 1947, 1949): 54, repro., as by Botticelli. Summary Catalogue of European Paintings and Sculpture. National Gallery of Art, Washington, 1965: 17. Shapley, Fern Rusk. Paintings from the Samuel H. Kress Collection: Italian Schools, XIII-XV Century. London, 1966: 123, fig. 337. European Paintings and Sculpture, Illustrations. National Gallery of Art, Washington, 1968: 10, repro. European Paintings: An Illustrated Summary Catalogue. National Gallery of Art, Washington, 1975: 38, repro. Shapley, Fern Rusk. Catalogue of the Italian Paintings. 2 vols. Washington, 1979: 1:84-85; 2:pl. 56, as Studio of Botticelli. European Paintings: An Illustrated Catalogue. National Gallery of Art, Washington, 1985: 57, repro. Boskovits, Miklós, and David Alan Brown, et al. Italian Paintings of the Fifteenth Century. The Systematic Catalogue of the National Gallery of Art. Washington, D.C., 2003: 146-151, color repro., as by Botticelli.